Most of us have felt annoyed by the itchy red bump left by a mosquito dining on our blood. But in many parts of the world, the pesky insect’s bite has a far more serious consequence – deadly malaria. With more than 200 million annual cases of malaria globally, scientists for years have been working on an answer to the problem. Now Portland biotech firm DesignMedix Inc. believes it has a cure for drug-resistant malaria parasites. The drug – DM1157 – is in human clinical trials at the Duke Clinical Research Institute in North Carolina. In 2006, Lynnor Stevenson (currently DesignMedix CEO) and Sandra Shotwell were consultants working with the Bill and Melinda Gates Malaria Vaccine Initiative. Among other things, they learned about various business models, one of which included mentoring entrepreneurs in the Portland area. 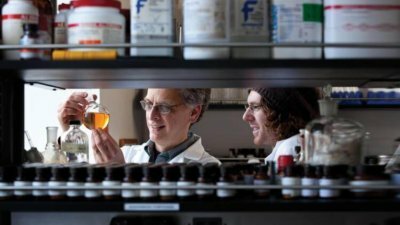 Shotwell and Stevenson met David Peyton, a Portland State University chemistry professor who wanted to find a way to develop his malaria drug – DM1157 – but needed to move it out of the university and into the hands of a company. The trio shared a vision for commercial development and established DesignMedix in 2008. They received the first grant they applied for and have gotten a half-dozen more from the National Institutes of Health since then, along with funds from angel investors. So Peyton worked on modifying chloroquine. Armed with data and collaboration from Peyton’s laboratory, DesignMedix led the commercial development of DM1157. Fortuitously, “researchers found the drug remained effective even with extensive forced evolution of the malaria parasite,” said Shotwell, now DesignMedix president. Additional testing on blood samples drawn from patients in Africa and Asia found DM1157 killed the parasites in every sample, even strains that were extremely resistant. From the very beginning, Peyton and his team designed the drug to be easy and cheap to manufacture. Most who need it can’t afford to pay much or not at all. So the drug had to be a good match for the market. “While DesignMedix is the official manufacturer of DM1157, registered with the FDA, large-scale manufacturing is outsourced.” Shotwell said. “For humans, a very high standard must be met, and it’s a very expensive process to set up. So contract research organizations (CROs) are used. Pre-clinical studies went smoothly, and the FDA said MD1157 was ready for human testing. The first healthy volunteers take the drug in very small amounts. Then when it’s determined to be safe and have no side effects, testing continues to the next step, which involves seven dosage increases. These trials will take another year and a half. After the drug is proven safe in healthy people, phase 2 will begin on infected people in West Africa where malaria is rampant. “We hope to partner with a major pharmacy for the later stage, and they’ll probably name the drug,” Shotwell said.